Paul J. Angelle, and Wayne D.
DeLeo—to vice presidents of the parent company. Mr. Currence was also elected a senior vice presi- dent of Tidewater Inc. The an- nouncement was made by John P.
Laborde, chairman and chief exec- utive officer of Tidewater Inc. Corporation of New Orleans. Prior to joining Gulf Fleet, he spent seven years with Tidewater Inc. as an administrative manager. Southeast Asia, Australia, Brazil, and Trinidad. He joined the compa- ny in 1975 as a sales representative, and served the marine group as vice president of sales before going into operations. Beam line. Panel line at Bath Iron Works. If you Ve looking for productivity, you should talkfoTTS. TTS specializes in solutions that offer immediate increases in productivity for your yard. Shotblast and paint lines. Panel lines. Beam lines for N/C cutting and marking of stiffeners. Heavy lift and ship transfer sys- tems. Material handling systems. Give us your particular production prob- lems. Let us propose how to reduce material handling costs, mechanize production and increase productivity. We are just a phone call away. NEWPORT NEWS • LONDON • BERGEN • OSLO • HALIFAX 1965 as an accountant, and was pro- moted to area manager in Iran and later to area manager for Mediterra- nean and Egyptian operations. He was later promoted to area man- ager-Singapore, and presently serves as regional vice president for the North Sea, West Africa, Egypt, and Italy. Industries shipyard in Ulsan, Korea. ODECO's Ocean Odyssey Class, semisubmersible units and built in 1983 to ABS classification. The new units will be capable of operating in water depths of up to 3,000 feet. All aspects of classification relat- ing to plan review, structural analy- sis, topside facilities and machinery review, and coordination of all sur- veys of the new ODECO rigs will be handled by the Offshore Engineer- ing Division of ABS. 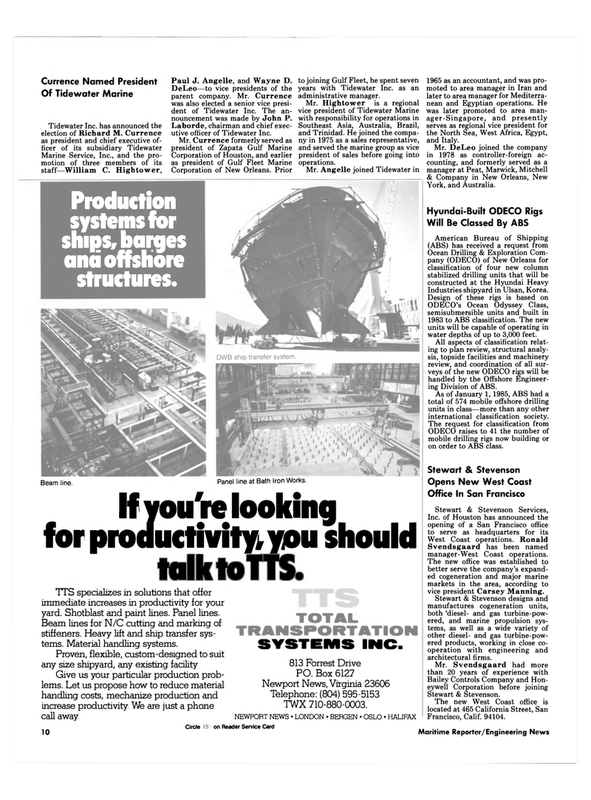 As of January 1, 1985, ABS had a total of 574 mobile offshore drilling units in class—more than any other international classification society. ODECO raises to 41 the number of mobile drilling rigs now building or on order to ABS class. Svendsgaard has been named manager-West Coast operations. The new office was established to better serve the company's expand- ed cogeneration and major marine markets in the area, according to vice president Carsey Manning. Stewart & Stevenson designs and manufactures cogeneration units, both 'diesel- and gas turbine-pow- ered, and marine propulsion sys- tems, as well as a wide variety of other diesel- and gas turbine-pow- ered products, working in close co- operation with engineering and architectural firms.